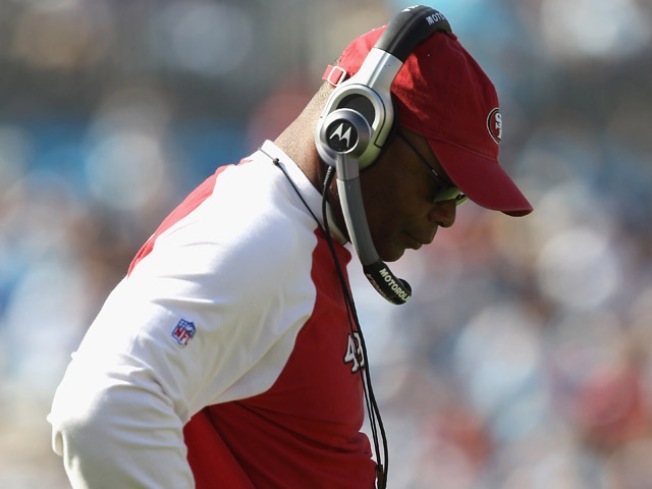 A season that started with high expectations in the City by the Bay ended in disappointment for the San Francisco 49ers in St. Louis, costing head coach Mike Singletary his job in the process. The team, which lost 25-17 to the Rams with a potential playoff appearance on the line, announced the firing after the team returned home to the Bay Area Sunday night, reports ESPN. The defeat eliminated the Niners from the playoffs for the eighth straight season and leaves the team heading into the off season with a slew of questions about the future direction of the franchise. Singletary, a Hall of Fame linebacker who terrorized opposing players as part of the famed Chicago Bears defenses of the 1980s, took over as interim coach last year after San Francisco fired head coach Mike Nolan mid-season. The team displayed a competitive spirit and finished the season with a 5-4 mark, generating enthusiasm amongst the starved fan base. But the 2010 season started with the Niners, who were expected to contend for the NFC West crown, dropping their first five games and found the team eventually dealing with a quarterback controversy between Alex and Troy Smith that was never resolved. Star running back Frank Gore also fractured his hip in the second half of the season, robbing the team of its most consistent offensive threat. In a statement, Singletary expressed his gratitude at having the chance to take the reigns, even if it didn't end the way he wanted. "One of the greatest experiences of my life was having the opportunity to coach the San Francisco 49ers, " he said. "I wish the 49ers nothing but the best. I am thankful to the York family for having given me the opportunity to be a head coach in the NFL. I am indebted to them for that. I am also thankful for the Faithful fans, I am just sorry I couldn't give them more." Singletary finished with a 18-22 record in two plus seasons with the franchise. Defensive line coach Jim Tomsula will lead the team in its season finale against the Arizona Cardinals. The Niners are not completely lost, though. In addition to Gore, the offense features other young play makers such as All-Pro tight end Vernon Davis and wide receiver Michael Crabtree. On the other side of the ball, they have standout linebacker Patrick Willis. Due to their win/loss record, they may have a shot at a franchise quarterback in the draft, with Stanford star and Heisman runner-up Andrew Luck surely at the top of their wish list. And there are rumors that former 49ers assistant and current "Monday Night Football" analyst Jon Gruden could potentially be interested in the coaching position.